Released almost a year and a half ago and well received by the press (including us), Civilization VI is finally getting its first expansion this month called Rise and Fall. Aiming introduce new features such as new ages, a loyalty and governor system, as well as enriching the game with new civilizations. Will this expansion push the series even further? While the game has been getting constant updates, and scenario packs since its launch such as Australia, Persia and even Poland, what was truly missing was what I was annoyed by with game in my original review: clarity. There’s been a lack to information to what each element in the game is doing in the background, like when is population going to grow, or how are other cities going to get influenced by my culture, and so many questions that used to be clear on paper in previous opus. Thankfully Civilization VI: Rise and Fall adds these crucial information, to make the experience clearer and gameplay more precise. One example for example is to better understand the golden ages (or newly added dark ages), which are displayed by a bar that fills up according to “Historic Moments” points earned after each turn. When you face an important historical event for our civilization – such as discovering a new continent, build a wonder, destroy a barbaric camp or establish a religion – you earn those points, which indicate into which direction you are going as a civilization: dark, normal, or golden age. During a dark age, the pressure of your residents on loyalty is much higher and it is important to tactfully pick your next move. Yet, the dark age provides you with some powerful political opportunities, but with a higher risk. It’s a gamble after all. Along with all the other elements, such as religion, research, influence, development bonuses, and city-state quests, it creates an extremely complex environment for your civilization. The whole thing is well-balanced. A dark age will not ruin you, nor a golden age will not bring you so much of a head start as it used to, but it can make a really close race switch in your favor if you plan it well. On top of that, the diplomacy mechanics have changed a lot, dramatically even, if I could say so myself. If you have a friendly relationship with another civilization, you can enter into a military, cultural, science, religious or economic alliance. The longer that alliance last, the more both sides benefit from it. With each level of alliance, comes new bonuses, but you’ll have to remember that it’s not just you getting them, but also your ally, which eventually you wouldn’t want winning the game. This new diplomacy mode are likely to appeal to players who are not into the military victory. For example a long-lasting cultural alliance could help boost each side’s non-hostile takeover of tiles, until there’s just the two of you. But if you’re more of warmonger – such as I – you’ll probably find out the new feature known as Emergency. Depending on big major changes in the game, like conquering a tile with a sacred religious site or firing a nuke, a coalition of numerous civilization can call for an emergency, which has global implications. For me, Civilization VI: Rise and Fall means one key thing: the return of the Mongol hordes led by the mighty Genghis Khan. Last time I played with the Mongols, was back with Civilization V Scenario Pack, but this expansion gives them proper representation of their gruesome war tactics. Nevertheless, that’s just my personal preference, and Civilization VI: Rise and Fall has in total of 8 new civilizations and 9 new leaders, which have their own traits. Each new civilization has its own advantages and some unique abilities that will influence its gameplay remarkably. But this new expansion most major change is all centered around loyalty. The Loyalty mechanics affect especially your own population, but also opposing cities. You no longer have to worry about research, military, religion and living standards, but also make sure that your citizens are loyal to you. On the other hand, a high level of loyalty ensures that you can take appropriate measures to put pressure on other civilizations’ cities. For example, if the loyalty of a city falls to zero, it will fall into a mutiny or civil war, and declare itself for a short period of time as a free city, renouncing its founding nation. Those then acts independently and sometimes a bit like barbaric settlements, but can fall to your rank with either high loyalty pressure or rigid military use, which is usually are not punished by other nations. But there’s another aspect to consider. The further a city is from the influence of its own founding area, the harder it becomes to maintain its loyalty. This reduce the old strategies of settling somewhere where the land is only rich and fertile, as you don’t want it to be far away from your trade routes, or longer reprovision periods. Else, that city will sadly collapse and probably side with the closest neighbors. The Governors are the other, pleasant addition to Civilization VI: Rise and Fall. Thanks to civic research, you’ll be able to earn new Governor Points that can be spent to hire one of seven available governors, each providing special bonuses. Or if you are falling into a specialist strategy, you can also use those points to improve one already present in your city, with the aim of guaranteeing further advantages to that region. Civilization VI: Rise and Fall was reviewed using an PC downloadable copy of the game provided by 2K Games. The game was tested on a PC running Windows 10 Pro, with a 4GB NVIDIA Geforce GTX 960 fitted on a 5th Generation Intel i7 4720HQ 3.2Ghz CPU and topped with 16GB of RAM, as well as a Surface Pro 3 for touchscreen gameplay. We don’t discuss review scores with publishers or developers prior to the review being published (click here for more information about our review policy). 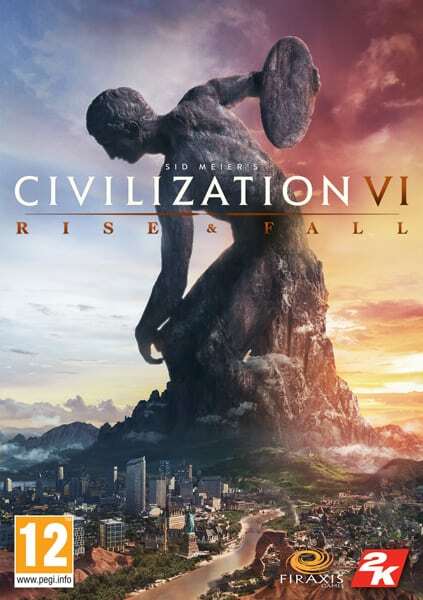 Civilization VI: Rise and Fall is a satisfying expansion to Sid Meier's 4X turn-based game, adding enough core gameplay features, civilizations and leaders to renew the gaming experience. Don't expect a groundbreaking change, as this is not a sequel, and some of the old faults are still there like difficult UI or the strange AI when it comes to warfare decision and weird diplomatic moods, but it's still a notable expansion.